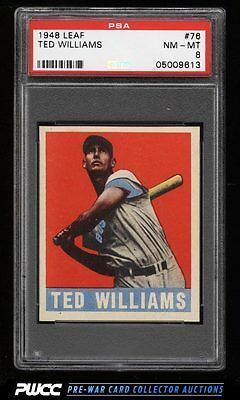 A drop dead gorgeous card from the '48 Leaf production. Completely pack fresh throughout boasting four essentially MINT corners and near flawless print. The red background really pops out of the holder on this one. Easily among the hobby's finest examples and comes with our highest recommendation. One of nearly 17,000 cards, lots, and sets up for bid in our 8th Auction of 2016. Click on the link above to view the other PWCC auction lots.